Socialised or commercialised healthcare for the UK – which would you prefer? This blog is a little longer than my usual offerings but I hope you will take a few minutes to read it and then to share it widely. I think the message is important and helps to clarify the current arguments about privatisation of the NHS. Those with short attention spans may wish to cut to the take home message by going to the last paragraph (but you will miss a couple of brilliant video clips). There has been much debate in the media recently about “privatisation” of the NHS. Should we allow parts of the service to be subcontracted to private companies or do we believe that our future health care needs will be better provided by not for profit, publically owned organisations? Clearly this is a crucial issue but in some senses the “p” word is unhelpful and can be misleading. Much of the current service is already in private hands. All GPs are independent (private) practitioners and are not employed directly by the NHS and many existing services are already provided by the private healthcare industry under the NHS banner. The law has been changed so that further privatisation is pretty much inevitable and effectively irreversible, so the argument about privatisation is not about “if” but about “how much” and “how fast”. The main weakness of the term “privatisation” is that it allows the argument that that as long as the NHS remains free at the point of need the financial basis of its providers is irrelevant. I don’t believe this argument to be true but will park it for the moment and come back to it at the end of this piece. To complicate matters further the term privatisation has acquired political connotations and has a tendency to divide people on party political grounds – not a great help when trying to engage the general public in this critical debate. A much more important question is what are the underlying principles that govern healthcare strategy in the UK? To my mind there are two broad approaches – socialised or commercialised medicine. Socialised medicine is characterised by central control with the PRIMARY intent of achieving the maximum amount of health gain from the available cash. Commercialised medicine is characterised by relinquishing control to market forces with the PRIMARY intent of extracting the maximum amount of profit from any available cash. Ironically the term socialised medicine was first used in the USA in the early 1900s. It describes a healthcare system that provides medical and hospital care for all at a nominal cost by means of government regulation and subsidies derived from taxation. The NHS is often held up as the archetypal example of socialised medicine. While initially a positive term in the USA, by the 1940s it had become a brickbat used to discredit Truman’s proposed national healthcare system. The implication was anyone advocating universal healthcare access must be a communist. Socialised medicine is strong in terms of cost, equity of access, efficiency in procurement, preventative medicine and economies of scale. On the other hand it tends to be bureaucratic and unwieldy, slow to innovate and struggles to control demand. Commercialised medicine runs according to the rules of the market place. The primary purpose is to generate profit from delivering health care. There is no central control or planning so it tends to be agile and innovative. Access to care is determined by access to cash so it is intrinsically inequitable. Companies are keen to increase demand and they can do this most effectively by promoting health anxiety. The United States health service is often held up as the archetypal example of commercialised medicine. A key principle of commercialised medicine is that profit comes from delivering the maximum amount of healthcare for the smallest cost while charging the highest price. Health improvement for individuals is not so important and in some instances becomes irrelevant. One good way to increase profit is to drive up demand by stoking up public health scares. Genital herpes was turned from a minor, inconvenient, untreatable disease into a hugely scary and stigmatising untreatable disease by a drug industry intent on selling treatments which are largely ineffective. A whole generation grew up fearing that they had halitosis which could stop them finding a partner, which they could not detect themselves and which their friends would not tell them about. 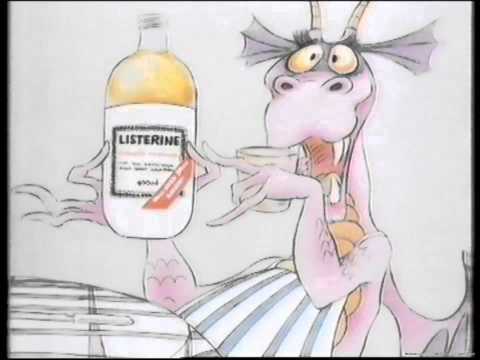 It was all so the manufacturers of Listerine could make millions from the gullible spitting gallons of their product down the sink. Well of course we can and do. Every health economy consists of a mixture of socialised and commercialised services. Proportions vary between countries with the UK being at one extreme and the USA at the other. Most European countries sit towards the socialised end of the spectrum. Where we sit on the spectrum is not set in stone and there is a real danger that we in the UK will move towards the US model. 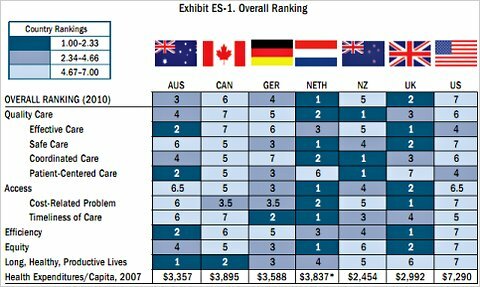 While both socialised and commercialised medical systems have their faults you only need to look at the comparison between US and UK health systems to see which is best. International studies have demonstrated time after time that the UK system is cheaper, more effective and fairer. It is sad that the US paranoia about “reds under the bed” in the McCarthy era and throughout the cold war led them to develop a health care system that is second rate, inequitable and overpriced. Thousands of their citizens die for want of healthcare or are financially ruined by chronic illness. In this respect you could argue that the US lost the cold war, and is still taking casualties to this day. In that case who on earth would support a commercialised health service? Employees of healthcare companies. This may include clinical staff – especially doctors. Politicians. Commercialised healthcare reduces the central tax burden on health, generates tax revenue and increased economic output. The wealthy. Progressive taxation means that the very wealthy pay more towards healthcare in a socialised system than they take out in healthcare. The healthy. If you don’t need healthcare why pay for it? Some political hardliners who have philosophical objections to socialised systems on principle. Combined these various groups are powerful but remain a minority. The problem is that the majority who stand to gain most from socialised healthcare come from the least empowered sections of our society. What is the difference between commercialised and privatised healthcare? I am very aware that this treatise may generate some confusion. The terms commercialised and privatised are not synonymous though there is an overlap. I agree that it is possible for private healthcare companies to take part in a fully socialised healthcare system as long as their activities are strictly regulated. This means that the care they provide should be controlled; the cost and quality of treatment is determined and paid for by government rather than market forces and they should not be able to manipulate demand (for instance by advertising). Much healthcare in the UK is currently provided by private companies on that basis. Further privatisation does not necessarily mean that we will move to a commercialised US style healthcare system, but it does of course increase the danger that we could move in that direction. While “privatisation” is a relatively new and trendy term, worries about commercialisation have been around since the birth of the NHS 66 years ago. 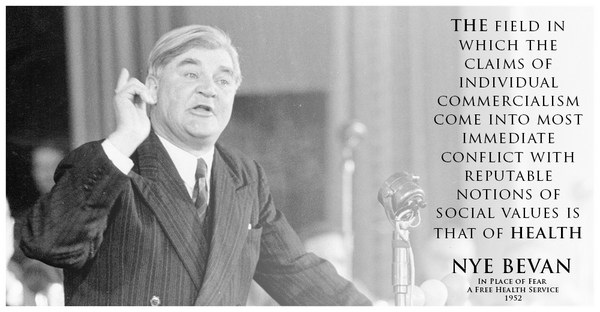 Nye Bevan himself said “The field in which the claims of individual commercialism come into most immediate conflict with reputable notions of social values is that of health”. So what are the chances that the UK will move towards a more commercialised model? Privatisation is already with us and is likely to increase. The way we prevent privatisation turning into commercialisation is to have strong central commissioning, tight controls on quality and clear rules about the interface between commercial and NHS services. Unfortunately these controls have already been eroded by changes in legislation such as the Health and Social Care Act which removed the responsibility for the health of citizens from the Secretary of State for Health. This, and the proposed Transatlantic Trade and Investment Partnership (TTIP) has opened up the NHS to future privatisation. 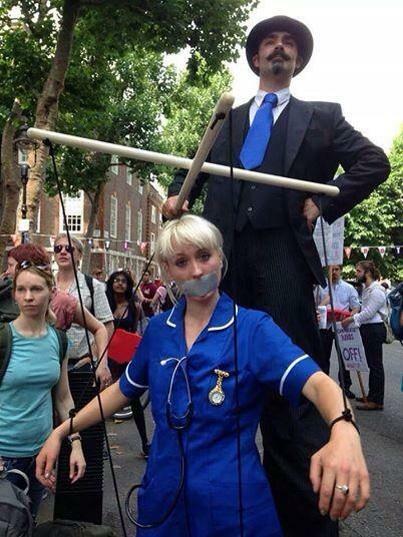 Existing controls on private healthcare providers such as NICE and the NHS commissioning board have been undermined in the press and the continuous barrage of anti NHS media has (to a degree) weakened the will of the British people to fight for it. All it will need is a relaxation on the rules about advertising and commercialised medicine will be unstoppable. There is real danger here. So what do we need to do next? 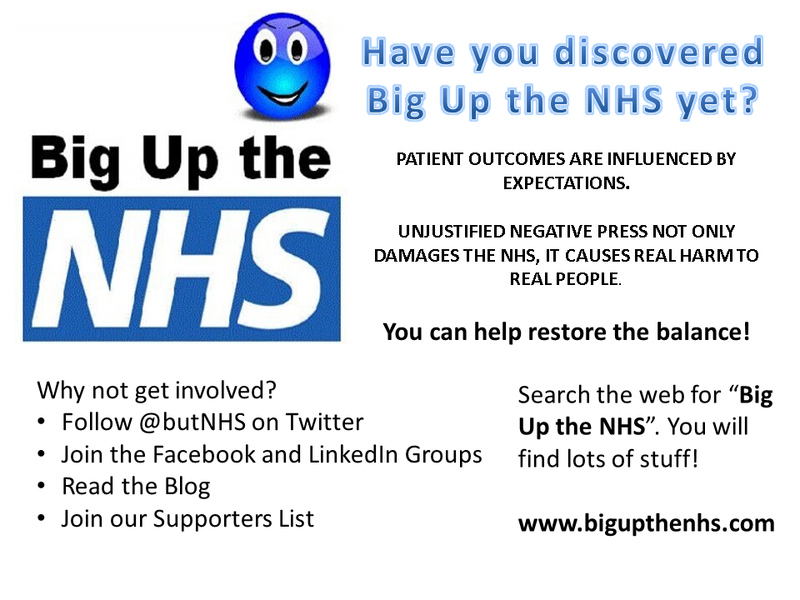 Doing nothing and we lose the NHS in its present form and risk drifting into a commercialised US style of health care. While privatisation alone does not necessarily lead to commercialisation it makes it much more likely. If you choose to swim with sharks you are much more likely to be bitten. We must continue the campaign against privatisation and try to reverse the changes in the Health and Social Care act and stop the introduction of TTIP. This alone is not enough though. We have to ensure that the NHS is strong enough to manage effectively the big International healthcare providers and stop them being able to exploit our sick and vulnerable. We must support the NHS regulators and make sure they know what we expect of them. We must remain solid on the rules about advertising and stop companies creating unnecessary fear to drive up demand. This will take a strong government driven by a strong public voice. I don’t know which party will succeed in the next election so it is imperative that politicians of all parties know that we value our NHS and want to preserve it from exploitation. This has to be the top priority as we approach the next election. So, to preserve the NHS we ALL have to do SOMETHING. Lobby your politicians. Join in the #March4NHS. Share your views on social media. Write to the press. And most important please, please, please Big Up the NHS! ← Who will save the NHS? Why British of all the people are becoming bankrupt in their intelligence under the reign of two ugly conjoined twins of Labour and Tory, who both had steadily dismantled this beast into un-manageable entity by selling off to private enterprises as part of vested interests. Why can’t it be looked from social enterprise model with the best brains under philanthropic model, as new innovative idea for the world to envy please!!!! As we have seen already this government, with help or collusion from the BBC and others, has spent months dribbling out headlines denigrating the public: 100,000s obese and at risk of diabetes and needing bariatric surgery as an example. In fact from what I have read about the increase in expenditure on diabetes medication and care in the past few years we would be forgiven for thinking that there is intensive diabetes input. This is not true though. The input for diabetics has reduced significantly and instead it seems to have moved to less management of the condition to more medicating for it. I have worked with a lot of diabetics historically and have never known such a lack of care as I see now. But the cost has exploded according to the BBC who clearly got this through the new NHS data collection grapevine. This makes no sense – suddenly all these people being diagnosed with diabetes and needing medicinal intervention whilst reducing clinical and dietary advice sessions. It seems to me, even just from an observational position, there is some extremely clever manipulation going on here. That is obviously being done with the involvement of government, NHS England, HSCIC and medical professionals. Forgive me if I see this as a complete disregard of the hippocratic oath but that is the drift I see for this condition and it can only mean that it is a general drift for the NHS. My own healthcare has been compromised several times in the drive towards commercial healthcare re cancer care. Many surgeons now operate a far more extensive private list and a much smaller public one. 50% (approx) of my operations have been done through the private route – all the private ones were as a result of me not being prepared to wait for a space and harassing staff until they listed me. Otherwise I would have just had to wait and hope they didn’t forget me. The NHS and leading professionals within it has become an absolute disgrace. I emphasise though that I am not referring to front line staff here. They work incredibly hard and competently. I am extremely angry at the collusion of medical professionals in this new deceptive, exploitative and uncaring NHS that just pays lip service to the ‘care’ in healthcare. Shameful. I think despite your claim not to, you assume that increased use of private companies to deliver services contracted & defined by the NHS equates to the commercial delivery as used in for instance the USA. The essence of keeping the NHS as a social delivery mechanism is public control & accuntability, not whether the resources delivering the socialised medcine are public or private. In just about every other aspect of our lives we are happy to mix the two approaches, although in terms of innovation & ‘time to market’ private usually wins hands down. Think of the innovations that have tranformed our lives over the last 30-40 years Mobile phones, internet, IT, cars, air travel, new drugs etc etc – all from the private sector – albeit sometimes with public priming. Your definition: ‘Socialised medicine is characterised by central control with the PRIMARY intent of achieving the maximum amount of health gain from the available cash’ needs innovation & change to achieve it with greater demands, new treatments & the appropriate use of private services. The secret is contracting & regulating the involvement. Personally I do not give a damm if my treatment is provided by a public or a private resource as long as it is to a good standard, is free to access & is regulated & accountable. PS I have no involvement with either public or private health entities.